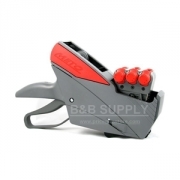 Meto label guns have an easy-to-handle trigger and attached handle. Being lightweight allows it to be easy to use while doing inventory pricing and coding. A curved application roller tip helps to prevent damage to packaging. 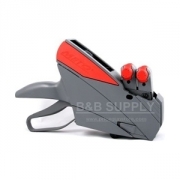 The biggest difference of the Meto price gun is the label feed system. 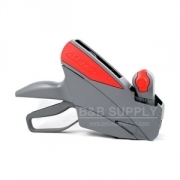 Instead of puncturing the backing paper in order to pull and advance the labels, as most other handheld labelers do, these tools use a transport system. The transport does not have spokes, but instead pulls the paper downward through the transport. One of the benefits is that you will not have to waste labels by having to peel them off the backing paper prior to loading a new roll of stickers in the gun. The body of the tool is gray and the colored inserts can vary. In the United States, the inserts are red, whereas in Europe, they are blue. A PL-Series Meto price gun is a great option no matter what the color. Do you already have a Meto price gun, but don't know the model number? It should be located on the side of the print head, near the dial knob you use to change the numbers. It would be clear plastic sticker. The long number that is imprinted into the plastic of the handle is only a serial number. In order to make sure you get the correct gun to work with your labels, you'll need to know the model number. All of these Meto label guns have a uniform pressure device (UPD). It's basically a spring loaded print-head. No matter how hard or soft someone pulls the trigger, the print head will contact the Meto labels, with the optimum amount of pressure resulting in a nice print on every label. This also eliminates any feathering effect (light or smeared ink) on pricing labels when a user is rapidly price marking.